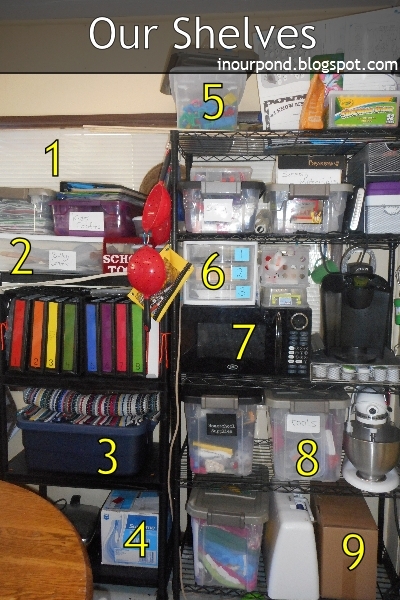 As you can see, my "classroom" storage shelves reflect the eclectic nature of our "apple room." 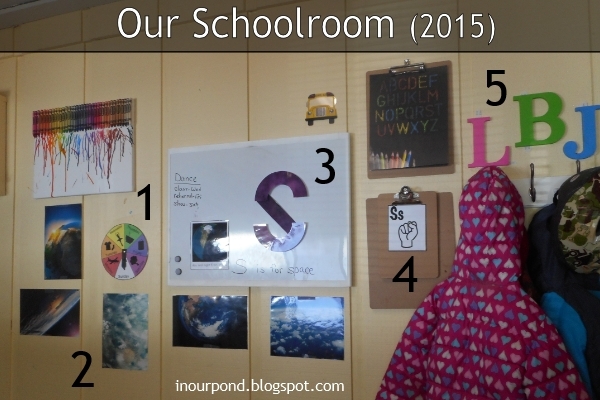 It's our eating place, our mud room, our storage area, our office, and our home school classroom. This is another reason why I didn't want to show *anyone* this picture. The Safari Toobs are stored in the bin labeled "invitation to play" with each set in it's own Crystal Lite container. The shoe box above the bin holds all the loose sensory materials. 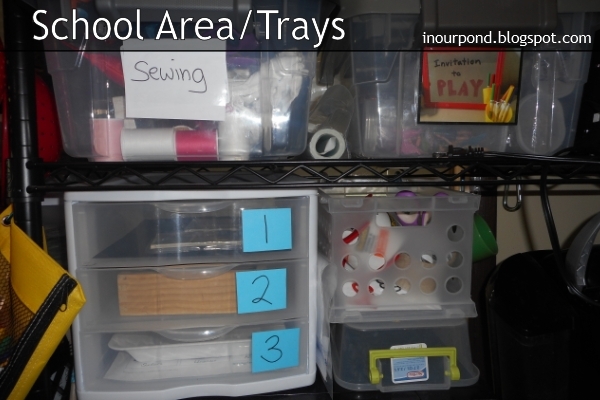 The 3-drawer cart is my version of a Montessori shelf of activity trays. Because of my kids' ages (still all under 4), I chose the kids' activities. The kids always sit in their high chairs/booster seats for school time, but, eventually, I'd like to teach them to use "the rug." 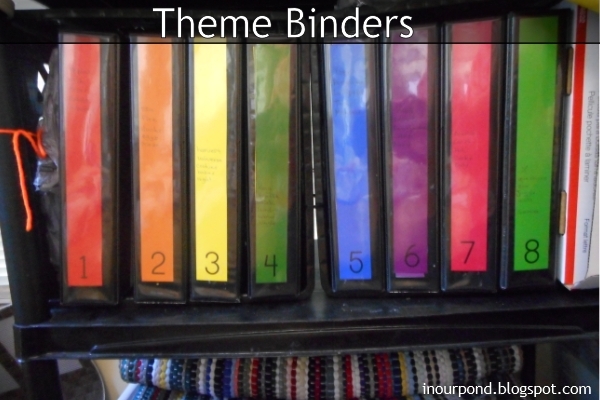 These are our themed binders. Last year, I crammed everything into two binders, but this year I expanded to eight. I'm preparing a separate post about the contents of these folders and how I set up all my printed materials. 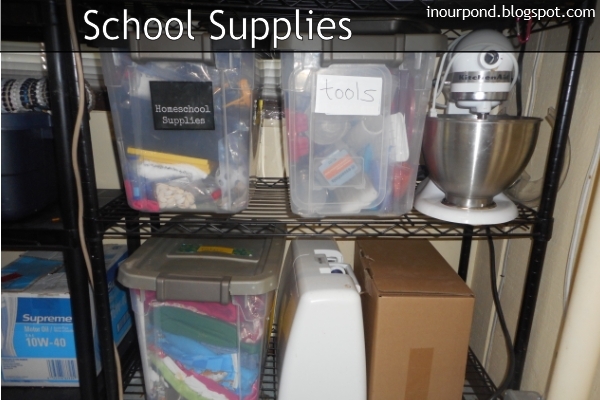 The two bins next to the mixer are filled with more school supplies. The one on the right is full of our "tools." It has trays, bowls, ice cube trays, and kitchen implements. The one of the left looks disorganized, but it has smaller containers inside it with our tiny counters, life cycle sets, and random other themed stuff. Office-type school supplies are stored in a plastic shoe box in my bedroom. This is the "teaching wall" of our classroom (sorry about the glare).